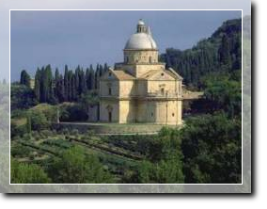 Montepulciano is situated along a narrow limestone crest, 605 m. above sea level. 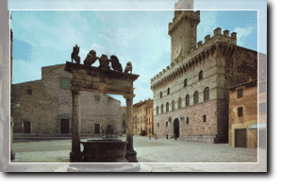 The town is surrounded by enclosing walls, which were planned by Antonio da Sangallo il Vecchio by commission of Cosimo I.
Montepulciano is famous for its Renaissance palaces, for its elegant churches and for Vino Nobile, one of the most highly valued Tuscan wine. The town centre unwinds along a main street, which goes up the hill and reaches the main square called Piazza Grande on the top. In July and August Montepulciano gives hospitality to the International Art Workshop, an art festival created by German composer Hans Werner Henze. In August two events animate this town: il Bruscello, on 14th, 15th and 16th August, when the actors play some scenes taken from the history of the town, and il Bravio delle Botti, the last Sunday of August. 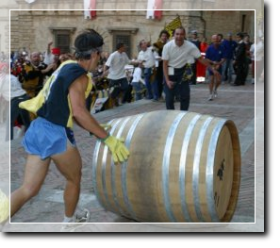 It is a competition among some contradas; the players have to roll big and heavy barrels up to the main square.